My friend, Jon Kinney, was showing me how he’s able to jump into dev mode with his server, Rails console, database console, test suite and Vim all running at once using tmux and the tmuxinator gem. I was obviously jelly and I wanted to find a way to do something similar, but since I don’t really use terminal Vim for regular development I thought tmux was overkill for just starting up my server, consoles and tests so I decided to find a way to be more productive in iTerm 2. 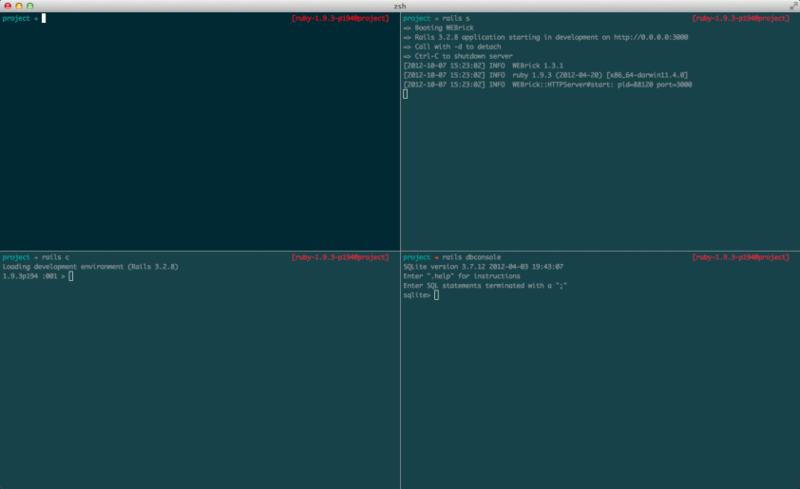 Above we have a regular terminal session, Rails console, database console and server running in 4 different panes. In order to open all the panes and run the commands to start our server, console, etc., we need to create profiles for each type of pane. You can create a profile by going to the Profiles tab in the settings pane. Give it a name and set the command you want to execute when the pane opens in the Send text at start input. 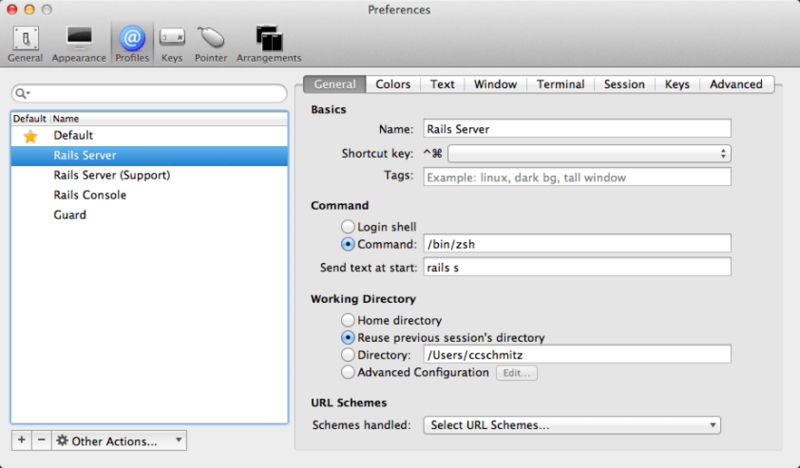 You might also need to select the Reuse previous session’s directory as the working directory. After you have your profiles setup, you can setup your workspace the way you want and then save the arrangement to use it again later. To create a new pane, use Command + Option + Shift + H for a horizontal split, or Command + Option + Shift + V for a vertical split. When creating a split, it will ask what profile you want to use. Once you have your panes setup the way you like, just hit Command + Shift + S to save the window arrangement. Unfortunately, you can’t set a hotkey for different window arrangements, but you can launch your default arrangement with Command + Shift + R.
You can save tabs in your arrangements as well. One cool thing I’ve used this for is starting up a bunch of web services I’m working on so all the APIs are available locally. This would be a huge pain without a saved window arrangement. You can dim, adjust the dimness and animate the dimming for inactive panes under the Apperance tab in the settings. Command + Option + [Arrow Key]: Switches to the next pane in that direction. Command + Shift + Enter: Maximizes the active pane. I find this to be really handy when digging through server logs and stuff. Command + [ or ]: Select the previous ([) or next (]) pane. You can customize the hotkeys by going to the Keys tab of the settings.